Uses: Church, Day Care, Fellowship Hall, Multi Purpose Room, Other Markets Colors: Red/Mauve Lengths: 13 panel 24'-1" Heights: 4'-0", 5'-0"
This day care center was set up in a large open space at the community center and needed to create smaller classrooms for the different age groups. However, they couldn’t build walls because the room was used by others in the evenings. 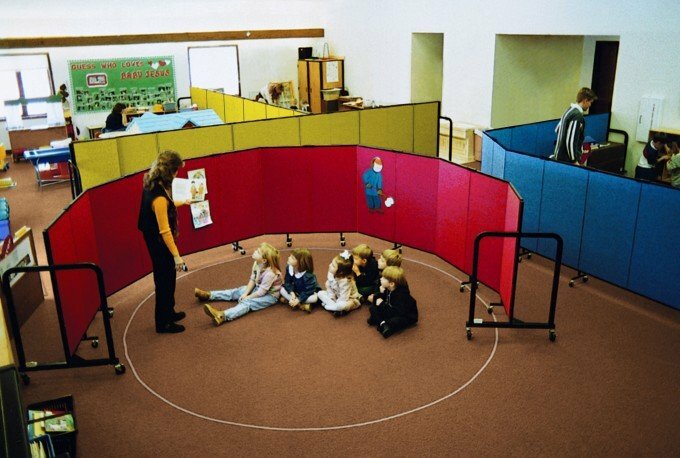 In order to solve their problem, the community center staff used colorful 4 foot room dividers to provided the division they needed between the classes. The dividers worked as planned without limiting light or ventilation into each classroom. Sturdy, durable and long-lasting, Screenflex portable walls are available in 6 heights and 6 lengths and 38 color choices. Units ship fully assembled and ready to use.